The Glebe Field This was the Vicar’s Field. Early vicars were also small farmers and could either run the farm, or let it to a tenant. The Cubitt Estate Thomas and William Cubitt bought these plots in the 1821 Sale or soon after and held the leases for many years. Newington Hall and Paradise Row. They were later developed as Statham Grove and part of the Burma Estate. This was a very large estate owned by Mt Alexander. When he died in 1891 the estae was sold and rapidly developed into Clissold Crescent, Carysfort Road and the Industrial Estate now redeveloped as Red Square. After the Second World War the Aden Grove area, which had been badly bombed, became part of the new Burma Estate. Albert Park Part of the site for planned for Albert Park which was to extend from Highbury Corner into what we now know as Finsbury Park. 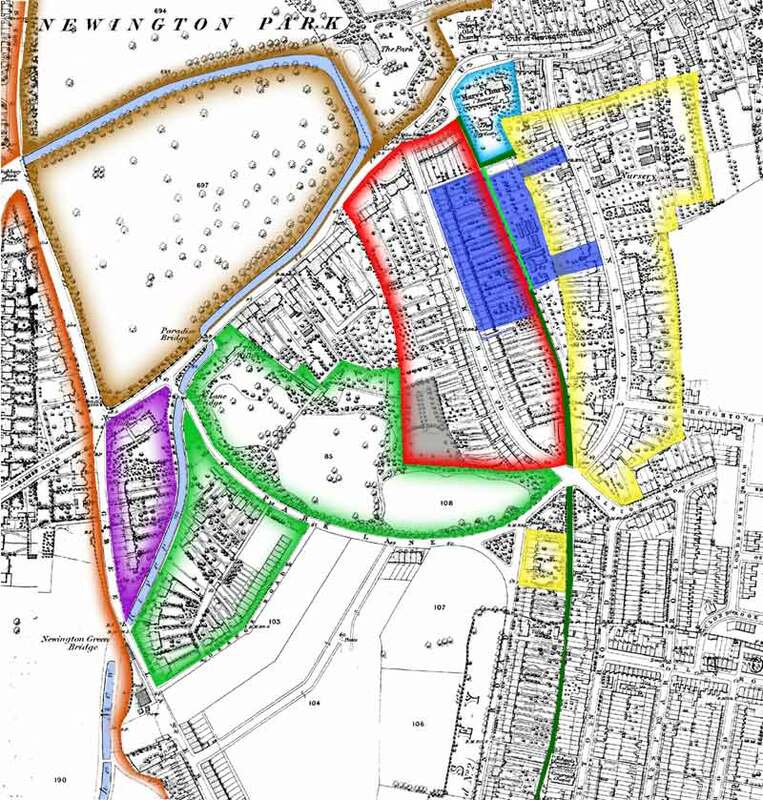 All of the proposed park except Finsbury Park was later covered with houses. Church and Vicarages The New Church and both old and new Vicarages.